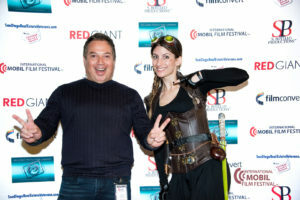 S. Botello Productions™ is one of the pioneer mobile film festivals and perhaps the first in the world to be exclusive to only to films shot with mobile phones which screens films on a big screen and rolls out the red carpet in a venue in San Diego, California. Our film festival has only accepted films shot with only mobile phones and began to form in 2009 launching an opportunity to every human being of any age in the world to share stories through film because everyone in the world has access to a mobile phone camera. International Mobil Film Festival™ takes place annually in San Diego every last weekend of April. #MFF2017SanDiego received over 260 submissions and screened over 40 films including a mobile feature film. 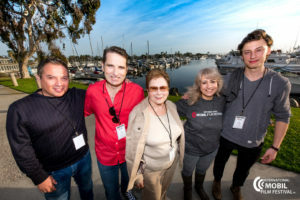 Filmmakers who attended in San Diego came from Canada, Australia, Chile and Germany. The ages of the filmmakers ranged from 11 years-old to 82 years-old. This year, we have two separate competitions for short mobile films (1-5min.) and feature mobile films (40-80min.). SBP launched the Global Mobile Film Awards™ as the Oscars of the mobile film industry. Our two founding members are SF3 SmartFone Flick Fest from Australia and Heartland Film Festival from Indiana. GMFA is for all film festivals who would like to provide filmmakers who submit a film shot with mobile phones and win an official award a free nomination to GMFA and compete to be the best of the best mobile film under separate categories. Member festivals reserve their right to nominate or not nominate winning films. Individual mobile filmmakers may submit a film shot with a phone to be considered for a nomination which won an official award in a non-member film festival for a fee.